Doctora en Filosofía y catedrática de Filosofía moral y política en la Universidad Autónoma de Barcelona. Ha sido senadora independiente por el PSC/PSOE desde 1993 a 1996. Ha sido consejera del Consejo Audiovisual de Cataluña desde 2002 a 2008. Es presidenta de la Fundación Víctor Grifols i Lucas (Barcelona). Ha publicado diversos libros sobre ética, filosofía política, bioética y educación. He has a degree in Philosophy from the University of Alcalá de Henares, in Theology and Biology from the University of Granada and a Masters in Genetics from the University of California (USA). He is a Doctor in Sciences and ad honorem Research Professor at the Centre for Molecular Biology of the Superior Council for Scientific Research at the Autónoma University of Madrid. He has participated in numerous national and international committees on bioethics. He is Professor of Surgery at Complutense University of Madrid, Medical Surgery Specialist at the 'Hospital Clínico San Carlos' and coordinator of the Surgical Infection Committee of the Spanish Association of Surgeons. He is also the Sub-director general of Cellular Therapy and Regenerative Medicine at the Carlos III Health Institute (ISCIII), Director of the National Bank of Cellular Lines (BNLC), President of the Ethics Committee for Animal Research and Welfare of the ISCIII, a member of the Board and representative of the Ministry of Science & Innovation on the Steering Committee of Bioethics (CDBI) of the European Council. He is the author or co-author of more than 150 papers in scientific journals, with a total impact factor over 180 and 15 on the Hirsh index. She is Doctor in Medicine from the Autónoma University of Madrid, associate head of the Genetic Service and sub-director of Research at the 'Jiménez Díaz' Foundation (Madrid). He is a Doctor in Medicine and specialist in Clinical Pharmacology. He is currently Professor of Pharmacology at the Pompeu Fabra University (Barcelona), director general of the Biomedical Research Park of Barcelona (PRBB) and of the 'Pasqual Maragall' Foundation. He is also a member of the Health Advisory Board (Ministry of Health). Until 2005, he was the director of the Municipal Institute of Medical Research (IMIM) of Barcelona. In 2000, he received the 'Narcís Monturiol' Medal for scientific and technological merit. She is Doctor in Law, Full Professor of Legal, Moral and Political Philosophy at the University of Barcelona (UB), UNESCO Bioethics Chair at the UB and director of the Observatory of Bioethics and Law Research Centre of the UB-PCB; coordinator of: the Consolidated Bioethics, Law and Society Research Group for the Regional Authorities of Catalunya, the Thematic Network of Bioethics and Human Rights and the Network for the Joint Teaching of Bioethics. She is a member of the Board of Directors of the International Association of Bioethics, the Advisory Committee on Bioethics of Catalunya and the National DNA Commission. She is Doctor in Law, professor of Constitutional Law at the UNED (Spanish National University of Distance Learning), Jean Monnet professor for the EU and an advisor to the European Agency of fundamental Rights (FRA). Until 2008, she was a member of the International Bioethics Committee of the UNESCO. She is a specialist in fundamental rights and the author of numerous publications in the field of biolaw, as well as PhD and specialisations programme director in these same subjects. He is a Doctor in Medicine and a specialist in Paediatrics. He is president of the Clinical Research Ethics Committee of Aragón and head of the Infant Nephrology Service of the Miguel Servet University Hospital in Zaragoza. He is a judge of the Supreme Court, a full member of the Institute of Studies of the Canary Islands, a member of the International Secretariat of Jurists for Amnesty and Democracy in Paraguay and of the Hispano-German Association of Jurists, as well as of several special missions on human rights for Amnesty International (Venezuela, Mexico, Peru). He received the 1996 Prize for Law from the Complutense University of Madrid. He has a degree in Pharmacy and Chemical Sciences and a doctorate from the University of Salamanca. He is Professor of Microbiology at the Faculty of Pharmacy of the Complutense University of Madrid. He has been president of the Superior Council for Scientific Research (CSIC) and the Advisory Ethics Committee for Scientific and Technological Research of the FECYT of the Ministry of Education and Science. He is currently director of the Extraordinary Chair of Genomics and Proteomics sponsored by the pharmaceutical company Merck, Sharp & Dohme. Until 2003, he was a member of the International Bioethics Committee of the UNESCO. He is a specialist in General Surgery for the Chamber of Medics of Westfalia (Germany) and the MEC and a specialist in orthopaedics for the MEC. He was a member of parliament from 1982 to 1996. Among other posts he has held, he has been President of the Special Study Commission on In Vitro Fertilization and Human Artificial Insemination of the Congress, as well as the author of the Commission's final report. He has also been president of the Bioethical Commission of the Council of Europe and founder of the International Society of Bioethics (SIBI). He is a Professor of Criminal Law and Director of the Inter-University Chair in Law and Human Genome, for the University of Deusto and the University of the Basque Country. He holds a PhD in Law and Medicine. He is a Member of the Supervisory and Monitoring on the Donation and Use of Human Tissues and Cells, the Bioethics Advisory Committee of Euskadi, the Steering Committee on Bioethics of the Council of Europe, the Ethics Committee of the Human Genome Organization, the Board of the European Research Area European Commission and President of Clinical Research Ethics Committee of the Autonomous Basque Community. He has received six honorary doctorates. He is Doctor in Medicine graduating from the University of Santiago de Compostela and is a specialist in Family and Community Medicine. He is currently a lecturer in bioethics at the Andalusian School of Public Health (Granada). He has a Masters in Bioethics from the Complutense University of' and a Master in the Administration and Management of Health Services from the Pompeu i Fabra University (Gaspar Casal Foundation). 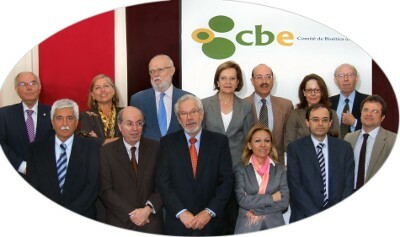 He is, likewise, a member of the Ethics and Research Commission for the Autonomous Region of Andalucía. Licenciada en Medicina y Cirugía. Médico Adjunto del Servicio de Inmunología del Hospital Universitario Ramón y Cajal. Ha sido Subdirectora Médica de Docencia, Investigación y Calidad, y Directora de la Fundación para la Investigación Biomédica del Hospital Ramón y Cajal. Máster en Evaluación y Mejora de la Calidad por la Universidad Autónoma de Barcelona y la Fundación Avedis Donabedian. Máster en Administración Sanitaria por la Escuela Nacional de Sanidad, cursó el Programa de Alta Dirección en Instituciones Sanitarias del IESE. Es miembro de la Sociedad Española de Inmunología y de la Sociedad Española de Calidad Asistencial y socio fundador de la Asociación Madrileña de Calidad Asistencial.